The item will be shipped from warehouse in Huston,USA,the shipping usually takes 3 to 5 days. Tray Size: 17.52" X 16.34"
COMMERCIAL-GRADE: Constructed of high-quality stainless steel, this commercial-grade hot dog griller features 11 non-stick rollers that can cook up to 30 hot dogs at a time. These slow rollers are ideally suited for grilling all varieties of hot dogs, sausages, taquitos, and more. SAFE AND CLEAN: Non-skid rubber feet provide a secure base for cooking, and the unit is equipped with a built-in fuse and a grounded US-standard power cord for safety, including a removable stainless steel drip tray for easy cleanup. PERFECT DESIGN: Front and rear controls lets you heat your hot dogs on some rollers and keep them warm. Grill your own stadium style hot dogs or sausages by using our commercial quality Roller hot dog machine. 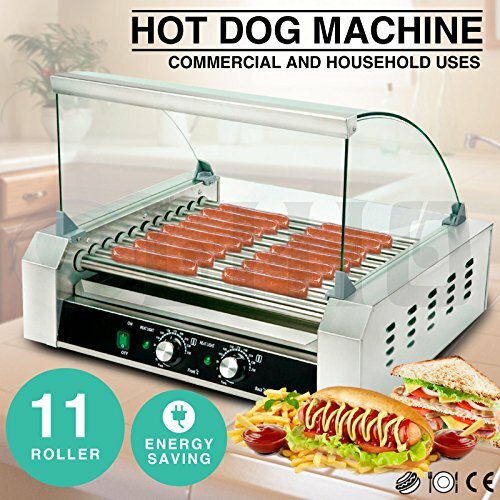 WIDE APPLIANCE: This hot dog grill is perfect for both commercial and Household Uses such as convenient stores, liquid stores, long meetings, farmer markets, all sporting events. BUY WITH CONFIDENCE: We offer 30 days money back guarantee and one year warranty, andunconditional offer replacement or full refund for product that defects in materials and workmanship. If you have any questions about this product by Senrob, contact us by completing and submitting the form below. If you are looking for a specif part number, please include it with your message.